It is often said that at times of great strain or terror, a person will always show their real face. That they will reveal themselves for who they truly are, be it a coward, a hot-head, coolness-personified, or just selfish and indifferent. I think that claim is a little doubtful, personally. I find that at times of strain or terror, most people react quite mechanically, resorting to instincts that their upbringing has drummed into them, rather than in ways that flow naturally from their own personalities. Perhaps those instincts have become parts of their personalities, but there is a recognisable artificiality that sets in, especially when trying to contain anger or to hide fear. Dignity at all costs, I think that is the name we give it. But no. That is not a person being real. Sincerity, passion and inspiration – the earnestness of being true to what we most believe in – those are the qualities that bring out our truest selves, not fear. Today, Parliament gave us prime examples of both; on the one hand, we saw a man under stress retreating into the feeblest, most simplistic, and most instinctive fakery imaginable, and on the other, we saw a man full of passionate belief in what he was saying, putting on perhaps his finest-ever performance in Parliament. In the House Of Commons, the weekly joust of Prime Minister’s Questions saw Ed Miliband, leader of Her Majesty’s Opposition, confront David Cameron, and deliver one of the most brutal verbal pastings that Cameron has ever experienced since coming to power in 2010. The issue at stake was one of blatant, casual corruption in High Office, after two veteran Members Of Parliament and former Cabinet Ministers, Labour’s Jack Straw and Conservative Malcolm Rifkind, were both revealed in a sting operation to be acting as, so to speak, “Parliamentary bounty hunters” i.e. that they were offering to act in Parliament on behalf of a (fictitious, it turns out) Chinese company, in exchange for money. A little like the “Cash-For-Questions” scandals of the past, the “Cash-For-Access” revelation is the epitome of Parliamentarian corruption, as well as anti-democratic, as the MP guilty of taking the money is making himself a representative of whoever pays him the highest price, rather than of the people who elected him. Miliband, never blessed with the most authoritative speaking voice, started a little shakily, but he soon warmed to his subject, and found his articulate best as the exchanges with the Prime Minister became increasingly heated. Miliband was arguing for stricter, tighter controls on MPs financial activities outside their Parliamentary work, specifically a ban on them being allowed to hold a high-profile second job of the likes of a directorship. He asked, politely, whether the Prime Minister was in favour of leaving the current system unchanged. The response Cameron offered was that the rules as they stand need enforcing firmly. This did not seem entirely to answer the question (does he ever? ), although Cameron then added that changes had already been made during the current Parliament, such as the (largely-toothless) Lobbying and Recall Acts. In fairness to Cameron, this was one of the weaker aspects of Miliband’s performance, as it was something of a quotemine on his part; the piece he was quoting from was in fact a criticism of ‘dual mandates’ i.e. Members of Parliament in Westminster also sitting in one of the smaller Parliaments around the rest of the UK. But even so, the principle is much the same, especially the parts where Cameron argued “Parliament must be a full time commitment” and referred to serving “two masters” – I can see little practical or ethical difference whether the second master is a private company or a secondary Parliament – so it was probably okay for Miliband to use it. Cameron was noticeably shaken when he responded again, but if he felt the quotemine was unfair, it is interesting that he did not put the record straight. But he also failed to answer Miliband’s point – again. And here is where my earlier point about strain and terror comes to the fore. Cameron’s answer, delivered in a withering voice, was a rambling attack on Miliband for his early draft proposal for banning a wide variety of second jobs for MPs, one that, Cameron claims, would still allow an MP to be a Trade Union Official. That immediately set metaphorical alarm bells off in my head. Any time a Conservative says anything on the lines of, “Trade Union! Bad! Bad! Bad!” there is always a very distinct overtone of mechanical reversion-to-type. It is a little like a Creationist saying, “Adolf Hitler was an atheist!” (he was actually a Roman Catholic), a UKIP supporter crying out, “You’re defending child abuse!” (just for voting for any party other than UKIP), or an American militarist crying out “What about 9/11?!? We gotta stop dem Moo-zlimz takin’ over!!! !” In other words, it is a ‘hot button’ that the respective parties use to distract from and silence an argument that they can feel themselves losing. Trying to scaremonger about the ‘threat’ or ‘menace’ of Trade Unions has been a standard tactic of British Conservatives dating back to the 1970’s, since the (largely-exaggerated) ‘Winter Of Discontent’, and has been a particularly handy emergency cry at times when the immediate topic of discussion has been an uncomfortable one for them. Pretty much every time Tories resort to it, you can tell straight away that they are being evasive, therefore not being honest, therefore not saying what they are really thinking. Cameron, in short, was on the run. I suspect Miliband sensed the same slight edge of panic, as after that he really pushed Cameron far more strongly, and with far more sureness, than I have ever seen him do before. Without hesitation or the slightest stumble, he placed on record a firm promise that his proposed new rule would never allow an MP to become a paid Trade Union Official, a company director or a paid consultant. There were no obscurities, no havering, no possible hidden meanings, no ambiguities, just the firmness that only comes from sincerity. There was a note of anger in the challenge, but no fear or awkwardness, as he asked whether the Prime Minister would agree in principle (finer details to be ironed out later, which is entirely reasonable) to such a new rule. Yes, Mr Cameron. We must. Were you not paying attention? That is precisely what Ed Miliband was proposing. But you kept arguing against it. Miliband’s response was to reiterate his overall position, including another explicit commitment to support extending the proposed ban to Trade Union Officialdom. Here was where Cameron’s dithering dishonesty and flustered fakery became almost embarrassing to behold, as he restated, in barefaced contradiction of everything that had been said and done right in front of him over the previous four minutes or so, that Miliband was proposing a ban that did not extend to Trade Union Officialdom. Even though Miliband had so plainly, explicitly and unambiguously promised that it would, and that furthermore he would be perfectly happy to put the full details of the proposal up for negotiation later. It was an alarming display of dishonesty from Cameron, pusillanimous in its avoidance of the questions he was actually being asked, and also deeply insulting to the intelligence of everybody who was watching. Did he imagine that he was the only MP anybody was paying attention to or something? Cameron, clearly losing track of where he was and getting extremely confused and flustered, then tried to change approach completely by criticising the ‘timing’ of Miliband’s proposal. This was, again, bizarre, as when better to introduce a proposed new rule to combat Parliamentary sleaze than just after a case of Parliamentary sleaze has been uncovered (albeit, a case that would not have been very greatly affected by this rule-change)? Cameron then completely fired into the long grass by raising another total irrelevance – David Miliband’s high outside-earnings during his time in Parliament. By now, Miliband clearly had the scent of blood in his nostrils, and any exasperation he felt at Cameron’s ineffectual stonewalling was overcome by his certainty in what he was arguing for. He reiterated one more time his unambiguous offer to extend the proposed ban to Trade Union Officialdom, and challenged the Prime Minister to state whether he would be voting for Two Jobs or for One Job. It was interesting to note that Miliband was landing heavy verbal blows that left Cameron bruised and punch-drunk, without being particularly aggressive. He was just inviting Cameron to do a deal in full public view, to make a promise to the British people to combat sleaze. But see the harm such a request was able to do! Cameron appeared allergic to sincerity, as though any attempt on his part to show any will bring him out in breathless flushes. Cameron’s response yet again was to regurgitate the irrelevant, fear-mongering horlicks about Trade Unions, this time going as far as to accuse the Labour Party of being owned “lock-stock-and-barrel” by the Trade Union movement. It is not of course, and has not been since Tony Blair revised Clause IV. But even if it were, once again, so what? That is plainly nothing to do with what was under discussion, and by bringing Trade Unions up yet again, Cameron only reinforced how clearly he did not wish to be part of this conversation. Instead, he seemed almost to be trying to relive conversations that had ended in about 1986, furthering the strange disconnect between the Prime Minister and what was happening all around him. Cameron was saying that, for him to support a rule minimising MP’s freedom to take up secondary jobs, Labour must completely abandon any and all involvement with its largest support base? That is the most ridiculously lopsided ‘offer’ I’ve heard of since ‘The Herschel Walker Trade’ in the National Football League in 1989. Had Cameron offered to abandon all support for and links to the affluent and wealthy classes, then it would be a more even proposal, but as it stands, it is just a ridiculous demand dreamt up off the top of his head. Again, Cameron was making matters worse for himself; he had now compounded the air of helplessness surrounding him, by giving the impression of a big baby throwing a tantrum for being made to get out of bed, while simultaneously sulking about not being taken to the park. Miliband allowed a note of, clearly very real, contempt to enter his voice when he offered his final reply. “Let’s talk about a party bought and sold by the hedge funds!” he mocked, referring to the shameless, never-ending sale-of-principles by the Tories to Big Business. In many ways, Cameron had given Miliband an open goal by constantly banging on about Trade Unions and throwing badly-aimed cheap-shots, and it can be seen as impressive self-restraint on Miliband’s part that he waited until now to abandon appeals for an agreement and to send an insult back the other way. To an extent, it did not really matter whether Miliband even bothered to mention it – although it is a point that always bears repeating as the damage caused by Big Business interference in politics is always far more dangerous than any ‘threat’ from Trade Unions – as it was already clear that he had won the debate more emphatically and more completely than any other he has taken part in. What the debate showed us was twofold. First, the strain and terror of being forced to discuss conflict-of-interest, when leader of a party that is routinely dominated by people in such conflicts, turned Cameron into a cardboard cut-out Tory stereotype. His every word, his every reaction, seemed to come out of a 1970’s Conservative Party election leaflet. It was the primitive old knee-jerk instinct to invoke the spectre of ‘infernal’ Trade Unions, as though the worst things that have happened in living memory were all strikes. Cameron knew that he had absolutely no strong ground on the subject he was being asked about, so on instinct, he desperately invoked the issues of his childhood – trying to find any ground, no matter how irrelevant or obsolete, that he knew Labour might be vulnerable on. Such feeble, obvious evasion is made no less dishonest by being so obvious. Cameron should have resisted the instinct, because it will no longer work on an electorate with decreasing memories of the 1970’s. But he did not resist it, and so his performance today was atrocious. That is telling, for whatever else we might accuse Cameron of being, we know that he is not a bad performer. His strongest card has always been that he is quite a polished public speaker. But today, he was so bad that even some of his opponents, like myself, began to feel almost embarrassed for him. He was ‘not himself’, shall we say? At the other extreme, I have never seen Miliband so in control or so dominant in a debate. Part of the reason for his victory was that, with Cameron doing so abjectly, it was almost impossible for Miliband not to beat him. But even so, there was definitely something different about Miliband this time. He knew without hesitation that what he was proposing was right. He knew that most people around the country will approve of his proposed rule change. He knew that the conduct of Members Of Parliament over the last thirty years and more had been dominated by shameless cynicism, narrow interests, and personal greed, and that it was high time that action was taken to put a stop to it. He was not just hoping, or gesturing, or feeling his way, he knew. And with that knowledge, Miliband was able to debate with a firm sincerity that contrasted completely with Cameron’s faffing, and even came across as charismatic towards the end of the exchanges; now, charismatic is not a word I have ever associated with Ed Miliband, but charisma comes from a certainty in what one is saying. He was not particularly aggressive – as I said above, his questions for Cameron were largely composed of appeals-to-conscience rather than attacks – nor was he more than intermittently angry. He did not need to be, because he was arguing for something he clearly believes in. It meant he was able to be himself, and the result was a performance so real that it is misleading to call it a ‘performance’ at all. Fear and stress make people into something dishonest, clumsy and confused. We might speculate that these are the real qualities of Cameron finally being revealed, but whatever the case, he was avoiding reality, not unveiling it. It was Miliband’s sureness that won the day, and perhaps gave us a critical glimpse of the kind of statesman he could potentially be if he fights more openly and frequently for what he really believes in. Renewables Or Subsidy, It’s Still A Silly Climate-Denialist Question. I am sure there are fossilised remains of ancient bacteria on the planet Mars who are aware by now of Victoria Ayling’s little gaffe last week, in which she appeared to ask the most oxymoronic question yet in the current election campaign, of what is to be done if renewable energy runs out. A lot of us have had a big laugh over it, including me, but at the same time there has been something of a counter-attack from Ayling and her sympathisers, arguing that she was not guilty of a silly contradiction-in-terms, but of missing a word out of her sentence. The sentence as spoken was, “What happens when renewable energy runs out?” which does indeed sound comically obtuse. Ayling and her defenders later clarified that what she had meant to say was, “What happens when renewable energy subsidies run out?” That certainly sounds a lot less paradoxical (although it does not make the slip of the tongue any less amusing, nor does it make people having a smile about it unacceptable; she is a politician after all, talking intelligibly is supposed to be her job). But, even were we to assume that that is genuinely what she meant – and I am not completely convinced by that for reasons I shall explain below – does it actually stop it being a silly question? I would argue not. After all, what happens when any subsidy runs out? If the project being subsidised is showing signs of yielding good results, it will probably be renewed, and if it is not, it will simply be dropped. The question is a little like asking, “What do I do when I finish drinking this glass of water?” to which the answer would be, if you are no longer thirsty, you wash the glass and put it back in the cupboard, or if you are still thirsty, you refill the glass with more water and drink some more. In the case of the renewable energy question, given that the local economy in Grimsby is gradually benefiting from fresh business and potentially significant numbers of new jobs, it is entirely possible that further subsidies will not even be needed when the current ones run out. I do not have access to precise information about it, so that should not be taken as read, but between the positive views of those close to the off-shore wind-farm projects, and comparing it to the slightly hysterical and obviously-erroneous rhetoric coming out of Ayling’s mouth, there is certainly no reason to expect the worst. For her part, Ayling seems to be trying to create a closed-ended fallacy; she is assuming that the renewables are only workable for so long as they are subsidised, and that it is a hugely difficult task for a Government to provide the subsidy. But neither assumption is particularly certain. The first, that renewables only work for so long as they are subsidised, will be conditional on how wisely the subsidies are invested from the outset. If the money invested is spent on sound infrastructure and a skilled workforce, then eventually it will pay for itself, especially when the resulting new employment generates plenty of fresh activity for other local businesses; the signs on that score appear promising. Considerable infrastructure in the Grimsby area has already been built, and more is to follow. Whatever the power output ultimately offered by these sources, they will be a valuable source of employment for a long time to come. The second assumption, that it is difficult to provide the subsidies, comes from the widely-held misapprehension that a Government’s money is ‘finite’, even when the Government itself is the issuer and the majority of money in circulation is electronic credit i.e. computer data that has no physical presence at all, and can be created or destroyed at a keystroke. Of course the Government can keep subsidising renewable energy, and with no great difficulty. With UKIP’s inclination towards Climate-Change-Denialism, there is a genuinely sinister aspect in this. Ayling described renewable energy as a ‘fad’, which looked at some ways is another sentence that sounds preposterous. Wind, steam and running water had been used as power sources (albeit in mostly very primitive ways) for thousands of years before the Oil Industry ever existed, and the renewables industry is a direct descendant of that history. But less amusingly, there have long been links between the Climate Change Denialist groups and Big Oil, and the usually-flagrant misrepresentations made by Denialists of legitimate Climate Science lead back, more often than not, to the Oil Industry’s jealous determination to maintain the enormous profits that go hand-in-hand with society’s high fossil-fuel consumption. But that sort of silly logic, of course, could be used against almost any policy that has ever been enacted by any Government in history. Anti-speeding laws and driving tests, for instance, have been introduced on our roads to prevent traffic accidents, but traffic accidents still happen, so should we get rid of traffic laws and driving licensing? Of course not, because the laws we have do reduce the number of accidents that take place, which still means more lives saved and fewer serious injuries occurring than would otherwise be the case. Murder has been outlawed for millennia, but murders still happen, so perhaps we should legalise murder? Similarly, medical practice laws are enforced to prevent doctors from mistreating their patients, and yet medical malpractice still sometimes occurs – just look at Harold Shipman. Should we therefore just not bother with medical practice laws at all? Ayling’s logic applied here would indicate that we should. Ayling also tried the standard xenophobic-sounding ‘Look-out-we’re-wasting-taxpayer’s-money-on-making-jobs-for-foreigners‘ routine of the UKIP policy platform, by insisting that most of the renewable energy jobs are going to non-UK citizens. But information provided by RenewableUK showed that over ninety per cent of employees are British citizens. My conclusion is that Ayling did mean that renewables could run out when she made the notorious gaffe, but she meant it in the sense that there will be times when they will not provide enough energy to go around, and so the overall power available could run short temporarily, resulting in power cuts. That is a genuine concern, but then it is a concern for the uncomfortably-near future even if we carry on using fossil fuels at the same rate; power demand is constantly rising and fossil fuel sources are going down. The reason she switched tack to subsidies was probably because it just seemed easier to explain away her mistake that way. So Ayling is not as foolish as the original quotation makes her sound. But one does not need to be that foolish to be a fool – only to be an outright imbecile. Tom Pride reporting on Malcolm Rifkind’s babbling resignation statement. Ah, now there’s a very familiar bit of verbiage when under investigation for possible sleaze/corruption – calling the matter a ‘distraction’. Usually an attempt to make what the speaker has done wrong sound trivial and irrelevant, even though it is not trivial or irrelevant enough for him to stay in the job. Rifkind has resigned as Chair of the Intelligence and Security Committee. In his resignation statement, Rifkind reckons that the fact he was prepared to be in the pay of the Chinese is not “relevant to my work as chairman of the intelligence and security committee”. “None one of the current controversy with which I am associated is relevant to my work as chairman of the intelligence and security committee of parliament. However, I have today informed my colleagues that while I will remain a member of the committee, I will step down from the chairmanship. But they’d be damned wrong. Given his decreasingly-effective campaign to prove that his party is not a collection of extremist nutcases, it is quite bizarre that Nigel Farage, the UK Independence Party’s most beer-swilling man-of-the-(excessively-rich-)people, has become a semi-regular commenter on Fox News Channel. When it comes to presenting outlandish, paranoid, right-wing accusations as substantive fact, the people running Fox News themselves have nothing to learn from anybody, and so becoming their ‘expert-voice’ on European immigration is perhaps not the most convincing way that Farage could demonstrate moderation. 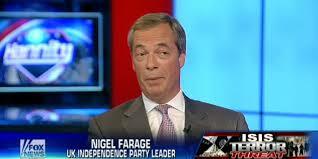 Farage On Fox News, a channel fittingly named after vermin. Just the fact that Sean Hannity once described Farage as a “future Prime Minister” (perhaps half-jokingly, but no more than half) says little for the network’s connection to reality; the leader of a party with UKIP’s degree of supportive over-exposure in the media will have no prospect of being Prime Minister any time soon when, even with that exposure, he still looks unlikely to get total seats in Parliament anywhere near to double-digits, and has a fundamentally divided support-base in any event (see later). But perhaps more pertinently, Fox has a shameless, heavy, and very explicit right-wing standpoint on just about any issue it covers. Even as it dares to call itself ‘Fair & Balanced’, it bitterly insults any leaning it sees as being away-from-the-right, and its first instinct when faced with arguments for social justice is to react with alarmist references to ‘Marxism’ and ‘class warfare‘. Fox has a typical far-right outlook dominated by a desire to find scapegoats for every problem – to find groups of ‘others’ to be regarded as hateful and to blame for the ills of society – to create the illusion of a world where there is not enough to go around, and then to display the scapegoats as being the ones who will have to miss out on a share due to their ‘undesirable’ characteristics. Now Farage, as most of us know (although clearly not Harry Mason), is as addicted to publicity as a crack-addict is to white powder, so there was little danger of him refusing offers to speak on Fox, but it was not a wise move in the climate of the last couple of years surrounding UKIP. The party leadership has been trying very hard during this time to distance themselves from the air of xenophobia and, frankly, comedic stupidity that has pervaded the party since its earliest days, and that job is quite difficult enough when so many of its members are prone to making crass, opinionated and uninformed public gaffes. But the exercise is defeated altogether when Farage allows himself to be so expressly associated with a poisonous and ultra-conservative hate-receptacle like Fox News. With all of Farage’s repetitive denials that his party is composed of racists and crackpots, and that the members committing these howlers are the exception and not the rule, the real truth should be very unsettling for the rational minority in his party (I am generously assuming that this rational minority actually exists, despite the ongoing lack of evidence); it is not just that the sheer bewildering number of incidents involving UKIP members (just since the turn of this year!) gives the lie to this claim. It is that by his own actions, Farage is himself reinforcing this impression. He quite cynically tried to take advantage of January’s ‘Charlie Hebdo’ shootings in Paris to spread and increase anti-multiculturalism rhetoric, along with Islamaphobic scare stories, which, even if they were not explicitly racist, can hardly be viewed as the deeds of a party leader who desires racial harmony, social peace, or internationalism. There is only one way Farage can address this image problem if he is to stand any chance of convincing the majority in the UK that his political orientation is not driven by xenophobia or racism, and I strongly doubt he will ever dare to do it, as it would alienate his core vote without guaranteeing him an adequate rise in support from elsewhere. Even if we were to assume for the moment that Farage is telling the truth when he denies he is a racist or xenophobe, he never quite acknowledges an ugly related fact – that an awful lot of UKIP supporters are both. So while Farage is unhappy to be accused of racism, he seems relaxed about accepting support from racists. Nick Griffin, the failed leader of the British National Party, last autumn declared that he was switching his allegiance to UKIP. Griffin is another to have claimed in his time that he is no racist, but I can state from personal experience that he is. (See below*.) What was Farage’s response when he heard that Griffin was now backing him? Well, he largely sounded uninterested, dismissive perhaps, writing off the declaration as ‘desperate-for-publicity’. (Er, a bit rich?) What Farage was not noticeably doing was declining the vote. He did not say, “I’d really be happier if Mr Griffin, and any others of his ilk, would vote for somebody else.” I would have been genuinely impressed if he had said that. But not only has he not really said it to Griffin, he never seems to say it to any of the racist fringe in the UK. The problem for Farage is that until he does say it, the whiff of suspicion surrounding his own attitudes will remain. So he has to go as far as to tell the racial politicos not to vote for him. It is not enough just to shout “We’re not racist!” over and over. We have seen all that before: The BNP tried bellowing it for years and it got them nowhere, because it was only a single step away from racism, not a rejection of racism. Farage has to say more than that. He has to say, “I am not a racist, and I do not want support from racists.” Indeed, all parties should say that from time-to-time, but, fairly or unfairly, it is imperative that Farage says it, and pretty frequently. That is the price Farage must pay for having a policy platform that is so heavily focused on Euro-skepticism and restricted immigration; even if, as he claims, the policies are not racist in intent, they are still very much in the territory of the racist, and therefore they are always likely to attract xenophobic support. Farage cannot on the one hand carry on cashing in on that hate fringe, while at the same time demand not to be associated with it. He has to be explicit and specific, and instruct the people in that fringe to take their activism and their votes to another party. As I say, it may sound unfair to make that demand of Farage more than of other party leaders, but his policy platform is of exactly the type that will appeal to the sorts of people he claims he is not, and what quite a number of people in his party have shown themselves to be. UKIP has already become strongly identified with such attitudes, whether Farage shares them or not, and if he wants the link severed, he has to sever it himself, proactively and unambiguously. He has to reject racism, and that can only be achieved by rejecting any amount of support it offers him. As I say, I doubt Farage will dare to do it. It will cost him more support than it is likely to win him; anyone impressed by it is likely to vote for the Conservative Party instead (not that they are exactly racism-free themselves), while the easily-angered racist fringe will become disillusioned very quickly and desert in droves. But therein lies a contradiction Farage has yet to reconcile. His support base was built on racism and xenophobia in the first place, and has only grown due to large numbers of newcomers who know almost nothing about UKIP, but just like the ‘cool-sounding’ idea of voting for a new party. (Yes, Harry, we are still talking about people like you here. Anyone who claims that UKIP is not controlled by bankers does not know anything about Nigel Farage.) Many of UKIP’s new supporters, I am fairly sure, are genuinely anti-racist and just do not realise how much the party is dominated by colour-feeling and xenophobia. Sooner or later, Farage will have to make an uncomfortable choice; in order to please the old, he will have to offend the new, or to please the new, he will have to alienate the old. Hence why, as I said above, Farage has no serious hope of ever being Prime Minister; his support base is too divided. All he can hope in the long-term is to become the leader of a party with clearly-defined ideas and identity that it currently lacks, but all the while realising that when that happens, he will lose a huge slice of support from somewhere. * I encountered Nick Griffin back in the summer of 2011. As an adopted-native of Salford, I live close to one of the major ‘hot-spots’ of the (largely-exaggerated-in-the-media) riots that spread across the country in August that year – ‘Salford Shopping City’ AKA ‘The Salford Precinct’. The weekend immediately after the unrest, BNP activists – ever the opportunists – arrived in Salford in their dozens and started trying to recruit as many locals as they could. Griffin himself was at Eccles Cross, just a short walk down the hill from where I live, and he was offering handshakes to passers-by before giving them the usual horlicks about how his party was there ‘to listen’ to the frustrations of disaffected local people. He approached me just as I was walking up the hill towards home, his hand proffered. I glanced at it and told him, perfectly accurately, “I’m Jewish.” Griffin’s face fell into a rictus of distaste, and he turned to look for someone else to pester. Not racist? Yeah, Nick. Right. 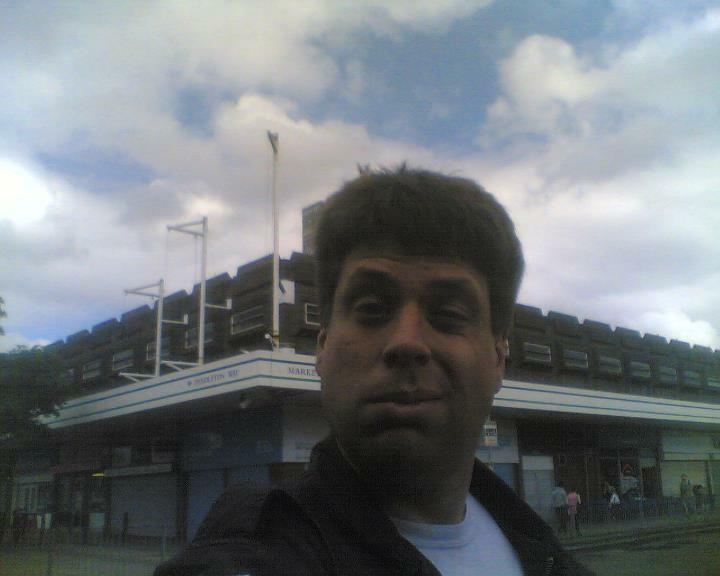 Me at the Salford Precinct (“Salford Shopping City”) on 13th August 2011, a couple of days after the riot. As you can see, I was distinctly underwhelmed by the very modest degree of ‘devastation’ I could see, compared with the loud hysteria to be heard in the media while the fighting was going on. Yes, the actual rioting was bad, as was the looting, but the reported damage inflicted was blown out of all proportion. At dinner-time, a UKipper orders a King-size peperoni pizza over the phone. “Make it pre-sliced please,” the ‘Kipper instructs. MESSAGE TO UKIPPERS: If you think this is unfair… good. After Victoria Ayling’s effort the other day, my only worry is that this might be playing down the inanity of UKIP. And I thought that UKIP meme from George Dale-Wilkinson (I shared it on Facebook yesterday) was the stupidest thing I’d ever read. Get a load of *this* little gem that Tom Pride has found, everybody…. I’m not making this up, I promise you. As a political satirist, I just LOVE the UKIP.